Moravian Cemetery, Staten Island, New York, U.S.
Cornelius Vanderbilt (Mey 27, 1794 – Januar 4, 1877), an aa kent informally as "Commodore Vanderbilt", wis an American business magnate an philanthropist wha biggit his walth in railweys an shippin. 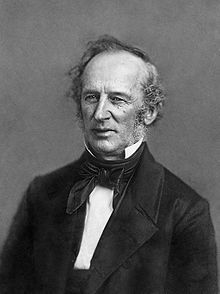 ↑ "Cornelius Vanderbilt. ; A Long And Useful Life Ended. The Renowned Commodore Dies After Eight Months' Illness His Remarkable Career As A Man Of The World His Wealth Estimated At $100,000,000 Particulars Of His Illness And Death". The New York Times. January 5, 1877. ↑ "Commodore Vanderbilt's Life". New York Times. January 5, 1877. This page wis last eeditit on 4 Dizember 2017, at 03:59.